Panelists at the September 2018 Forum were from left, former Sen. Richard Lugar of The Lugar Center, Ronnie Green of the University of Nebraska, Jay Akridge of Purdue, and Michael Martin of Florida Gulf Coast University. This Forum examined the return on investment in higher education for the food and agriculture sector. Topics discussed included the need to support publicly-funded research opportunities, funding models, the changing demographics of today’s students and opportunities for partnerships and nontraditional teaching models. You can listen to the audio of this Forum. Farm Foundation organizes these public forums to engage a full range of stakeholders in informed dialogue on food, agricultural and rural policies. Participants examine current policies, explore and analyze alternative policy proposals, and give voice to new proposals. Speakers provide brief topic summaries, with the majority of time devoted to discussion. 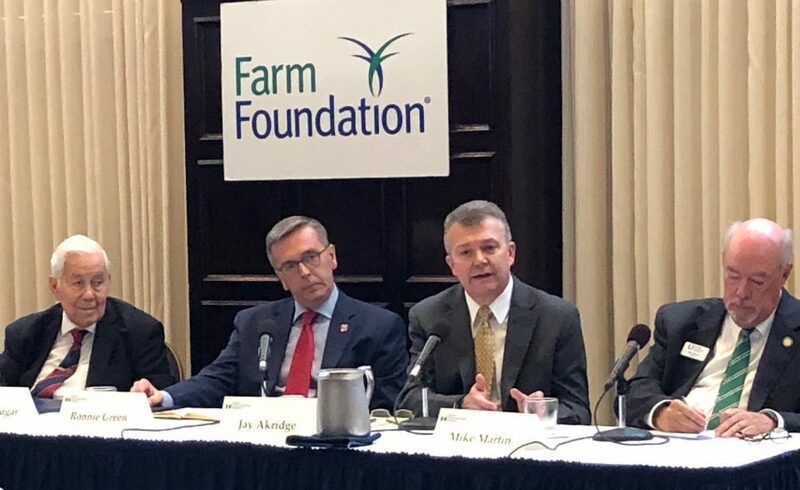 The opinions and views expressed at Farm Foundation Forums are solely those of the speakers, and do not represent those of Farm Foundation. The Forums fit the Farm Foundation mission as an agricultural policy institute cultivating dynamic non-partisan collaboration to meet society’s needs for food, fiber, feed and energy. Since 1933 we have connected leaders in farming, business, academia, organizations and government through proactive, rigorous debate and objective issue analysis. The Forums, which have been ongoing since February 2006, are opportunities to identify evolving issues, explore options to address those issues, and understand the potential consequences of those options.